Did you ever make Taco Soup? That’s the one where you add a packet of ranch dressing mix, a packet of taco seasoning, a can of this and a can of that to browned ground beef or turkey? Folks make it different ways, using different canned veggies (usually corn, tomatoes and beans). It’s really good and super easy to make. 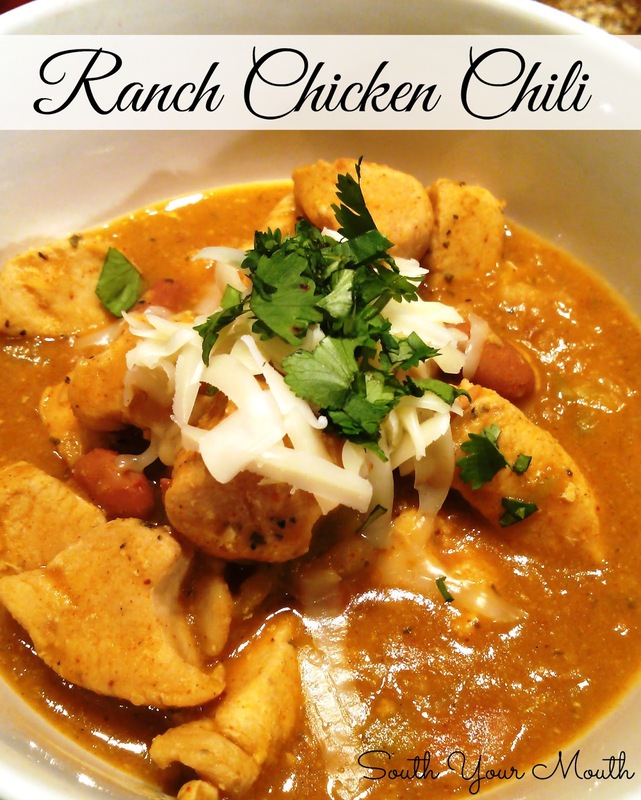 I got to thinking about it last week when I was daydreaming about how to make the chicken chili I wanted to attempt this weekend. I really like the ranch/taco seasoning combo so I thought I’d use it! And there’s something about ranch seasoning and chicken that just goes together. So I made the chili. And it was ah maze ing. But you want to know what’s best about it? It’s ridiculously easy. When I create a recipe I jot down how I think the recipe will work. I buy all the ingredients and set them on the counter and adjust my game plan as I go. My original recipe draft ends up looking like a schizophrenic’s to-do list when I’m done because I've scratched through things and added ingredients and changed amounts and added notes as I worked. This dish came together so quickly, I still had all sorts of stuff sitting on the counter that I just didn't need. I was tempted to add some of them anyway but, after tasting it several times, it was so good I didn't want to risk screwing it up! I served this with a big batch of Skillet Cornbread! Angel Baby and I decided the best way to eat this is to eat all the chicken out of the bowl then crumble the cornbread into the chili and let it soak up all the yumminess! Dice chicken into bite-sized pieces and season with salt, pepper and garlic. Heat oil in a large pan or Dutch oven over medium-high heat. Add chicken, onions and jalapeno and sauté until chicken is browned (we’re not trying to cook it through, just to sear it a little). Cook chicken in two batches if necessary so not to overcrowd the pan. Add ranch dressing mix and taco seasoning. Add beans and chilies with liquid (no not drain or rinse) and stir until all ingredients are combined. Reduce heat to low and cook for 1-4 hours. Serve with shredded cheese and/or chopped cilantro. Dice chicken into bite-sized pieces and season with salt, pepper and garlic. Heat oil in a large skillet over medium-high heat. Add chicken, onions and jalapeno and sauté until chicken is browned (we’re not trying to cook it through, just to sear it a little). Cook chicken in two batches if necessary so not to overcrowd the pan. Add chicken mixture, ranch dressing mix and taco seasoning to a crock pot. Add beans and chilies with liquid (no not drain or rinse) and stir until all ingredients are combined. Cook on low for 6-8 hours or high for 3-4 hours. p.s… I think a can of corn would be a great addition to this recipe! It wasn't on my original recipe draft but now that I've made it, I think I might add corn next time! I have yet to find chicken/ranch/taco/jalapeno recipe I wouldn't like. It sounds like a winner!! Can't wait to make it. Do you think a rotisserie chicken would work in this? Also, there doesn't seem to be enough liquid, did you not add any chicken stock etc.? Love your blog and your recipes. I had a can of chicken broth at the ready for this but it just didn't need it. There was enough liquid from the canned veggies and the chicken and onions put out some of their own as well. I think you could totally use a rotisserie chicken but you will probably need to add a little water or broth since the chicken is already cooked. Thanks Mandy.....I'm going to make this tomorrow. Instead of corn I'm going to add some hominy. Thanks for sharing such a great recipe. Will definitely give it a try.